[Double Set Challenge] Arc Cruiser, on Flickr. 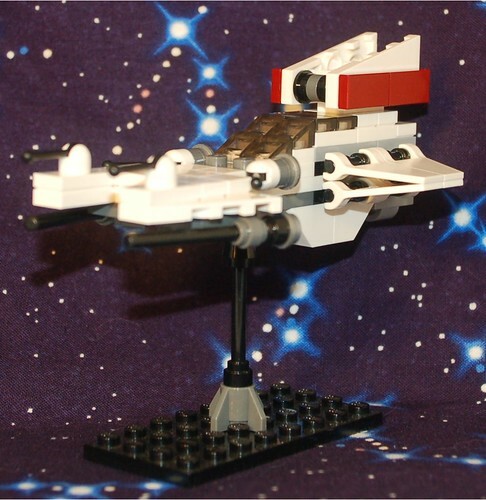 Made from two copies of the ARC-170 Starfighter polybag, this is intended to be a Cruiser for MFZ:IO. That's a really nice looking cruiser! I get a very strong Universal Century Gundam vibe from this one! VitorFaria wrote: That's a really nice looking cruiser! Thanks! I've had the picture sitting around for a bit in my backlog "pile". That's a very neat build. Good colours (an advantage of working from two of the same set I imagine). Really like what you've done with the wings on the side. That's a pretty spiffy double set challenge! Has a very anime-looking command bridge. Love it!